Having a strong credit history and maintaining a good credit score will open up vast array of opportunities throughout your life. Whether applying for a mortgage, a brand new car, or hoping to land a new job, having a good credit score will help you achieve your goals, and achieve them at prime interest rates. Here we will go over various ways to build your credit from scratch, and also touch on the various ways to maintain a healthy credit score. Let us first take a look at the options for building credit. Credit Cards - There are various types of credit cards that are worth considering. Secured credit cards: This type of credit card requires a cash deposit that is used as collateral. If you should miss a payment, the money held on account is used to bring your account current. When shopping for a secured card, be sure the credit card company reports activity to the three major credit bureaus. Student credit cards: Though these cards generally have lower credit limits and higher interest rates, they often have promotional offers and rewards. Store credit cards: While a store card can only be used at the particular store it is issued through, you will often be able to save money at that store when you use the card for your purchases. Be sure not to carry a balance, as the interest rates are often higher on store cards. Authorized User – Often times, parents will allow their children to become authorized users on their credit cards. If this is an option for you, you will be able to build your credit even though the account is still under your parent’s name. The responsibility for payment still falls on the main account holder; however, the activity will be reported to credit bureaus allowing you to build your credit. Have your parent check with the credit card company before adding you as an authorized user as some companies charge a high annual fee for this option. Co-Signer - If you are able to get a parent to co-sign a loan, this option will also help to build your credit score. Similar to being an authorized user, the co-signer will essentially be responsible for repaying the loan if you do not make the payments, and the co-signers credit score will also be effected. Loans – As with credit cards, there are various loan types to you choose from to build your credit. Credit-Builder Loan or Secured Loan: With this type of loan, the money you are “borrowing” is held in an account by the lender until the full loan amount is repaid. The sole purpose of this loan is to assist with building credit, and all payments are reported to the credit bureaus. Personal Loans: Personal loans, which can be obtained through banks, credit unions, or online, often carry higher interest rates for those without existing credit. Student Loans: If you are a college graduate, making on-time payments on your student loan, those payments will assist in building your credit. Setting auto payments will ensure you not late in paying, as any late payments will have an adverse effect. Auto Loans: While auto loans will also provide a sound foundation when payments are made on time, you may be asked for a co-signer depending on the amount of the loan. Rent Reporting – If you are already in a position where you are paying rent, you can use a rent-reporting service to document and report your rental payments to the credit bureaus. Two such reporting agencies are Rental Kharma and RentTrack. Let us take a quick look at some healthy habits to adopt in order to build and maintain a healthy credit report. 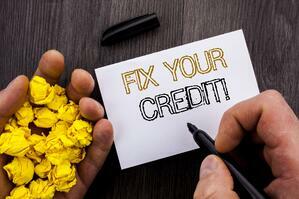 Keep a close eye on your credit utilization. Utilization refers to your balance versus your available credit. When carrying a balance on your credit cards, be sure that balance is not more than 30% of your available credit. The amount you owe counts as 30% of your FIOS score. Keep the amount of open accounts to a minimum, and keep your open accounts open long term. The age of your accounts in good standing makes up a large portion of your score. Make annual checks of your credit reports to look for discrepancies.